On November 3, Chantal Guimont attended an event during which the Honourable Marc Garneau, Minister of Transport, delivered on his commitment to create a safe, secure, green, innovative and integrated transportation system that supports trade and economic growth, a cleaner environment and the well-being of Canadians and their families. 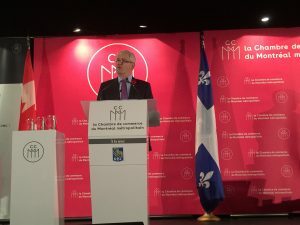 Minister Garneau was at the Chamber of Commerce of Metropolitan Montréal today to present his strategy, Transportation 2030, to over 550 key transportation stakeholders from across the country. The plan is based on the five themes around which the Minister consulted with Canadians, stakeholders, provinces and territories, academics and Indigenous groups over the past six months. Continuing working with provincial governments on a Pan-Canadian Framework that includes a strategy for transportation in Canada in order to reduce carbon pollution by 30% from 2005 levels by 2030. Working to ensure that drones (unmanned air vehicles) are subject to simple, clear and enforceable regulations. Investing in areas such as smart grids, electricity transmission, renewable power and smart cities plans that will lead to cleaner transportation technology. Supporting the development of regulatory framework for emerging technologies, such as connected and automated vehicles, in order to support a broader strategy on innovation. The government mentioned it had also already invested $62 million in electric car charging and low-emission fueling stations. The Honourable Marc Garneau presents his strategic plan for the future of transportation at the Chamber of Commerce of Metropolitan Montréal on Nov. 3, 2016.